Charlie was a former Ayr United, Celtic, Manchester United, Motherwell and Dundee player. During WW2 he was with Hibs but was given permission to play for United but did not sign formally until January 1944. 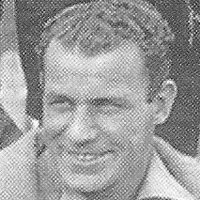 After assisting Manager Jimmy Littlejohn, Charlie took over the Manager’s job in November 1944 - at the age of 32, he remains the Club's youngest ever manager. He was kept on as a registered player until he was given a free transfer in July 1945 but stayed on as Manager until Willie MacFadyen was appointed three months later.